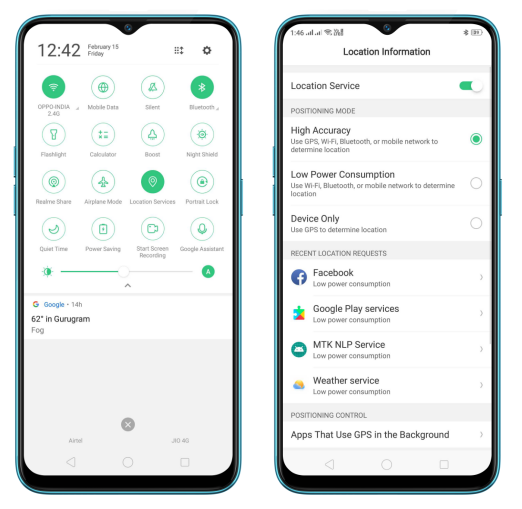 How to know About Location Service on your realme Smartphone? Learn how to use Location Service on your realme phone. 1. With your permission, Location Service allows the apps on your phone to access your current location to provide you with accurate location based information. 2. 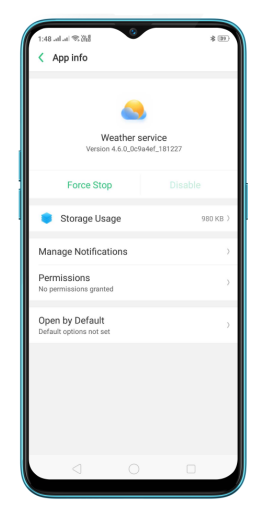 To use the feature, you need to connect and give permission to each app before it can use your location data. Swipe down from the very top of any screen to open Control Center, then click . Touch and hold to enter [Location]. 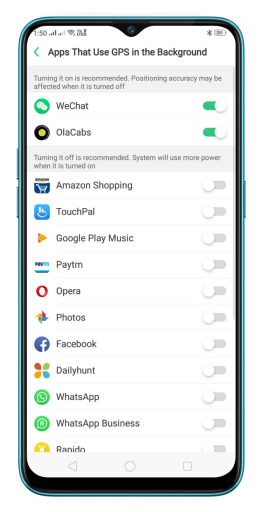 You can also go to [Settings] > [Additional Settings] > [Device & Privacy] > [Location Information] > [Location Service] and toggle the slider to green. 1.High accuracy (GPS, Wi-Fi, Bluetooth and mobile network). 2.Low battery use (Wi-Fi, Bluetooth and mobile network). You'll see a list of apps that have requested location. Click an app to enter App info, which provides you several actions to manage the app. Manage apps that use GPS in the background. You will see a list of apps that use GPS in the background. Continued use of GPS running in the background can dramatically decrease battery life. You are recommended to turn them off when not in use. 1. Sign in your Google account, then you can use Google Location Services to retrace your steps and share your locations with friends and contacts in real time. 3. For security reasons, the location information of your realme phone may be used when you make an emergency call, regardless of whether you enable Location service. If Location Service is not accurate or working. 1.Make sure your realme phone is connected to a Wi-Fi or Mobile data network with a strong signal. 2.Touch and hold to enter [Location], then choose [High Accuracy]. 3.You may in an area with weak satellite signal. Change your location and test again. 4.Keep a clear view in several directions. Walls, tall buildings, and other obstructions can block line of sight to GPS satellites. 5.Restart your realme phone and test again. 6.Go to [Settings] > [Software Updates] and update your phone to the latest version.